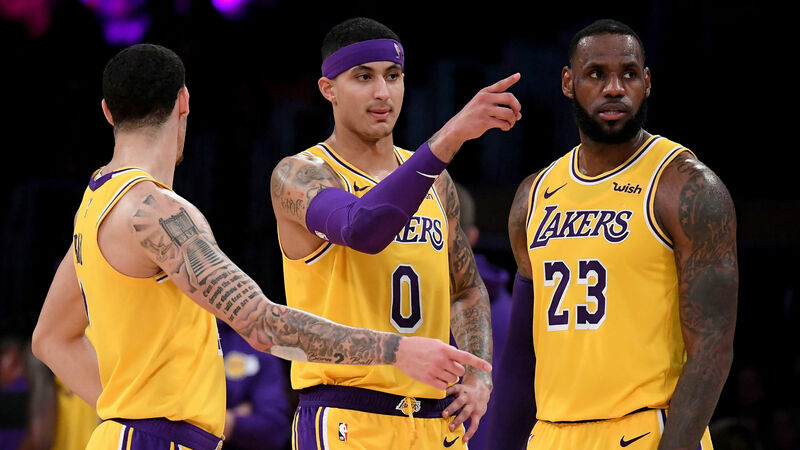 LeBron James is aware the Lakers haven't lived up to expectations, but he doesn't think the team's youth is to blame. Instead, the 34-year-old star came to the defense of his teammates and said he doesn't think the amount of pressure placed on his young teammates is fair. “You have four guys in our top eight rotation that you have to really rely on, and it’s unfair to them to ask for so much when they’re in their second or third year. We have Zo (Lonzo Ball), Josh (Hart), Kuz (Kyle Kuzma) and B.I. (Brandon Ingram). And we had Zu (Ivica Zubac) at the time," James explained Wednesday, per the Los Angeles Times. "That’s like five out of our top nine guys that we rely on, and they’re in their first and second year. You can’t find one other team in our league right now that has to rely on that much every single night from their young guys that’s in their first or second year." James, who signed with the Lakers during the offseason, has led Los Angeles to a 30-34 record and he's in danger of missing the postseason for the first time in 14 years. Including Wednesday's game against the Nuggets, the Lakers have 18 games remaining in the regular season to try and pass the Spurs (eighth in the West), Kings (ninth) and Timberwolves (10th) to sneak into the playoffs. James reiterated, however, that it's not fair to point to Los Angeles' youth as the problem because they are still learning. He also explained that it's an unusual situation to be in because there isn't another team in the league that has this type of challenge. “It’s unfair to those guys for us to continue to — we want them to learn, we want them to learn, we want them to learn — I want them to learn,” James said. “But also we have to understand that they’re young as well and they’re going to make mistakes. You just try to limit the mistakes as much as possible. You look at all of the 16 teams right now, the best teams in our league right now, just look at the guys they rely on every single night to be able to come through for them. If they have a young guy it’s probably one or two of them." He added: "It’s been tough on us."